We might associate artists of any kind—including great chefs—almost exclusively with their most public activities; it's sometimes tempting to think they spend their time at home doing only that thing we know they do so well. But like so many other Utahns around you, the person who made that amazing meal for you has hidden talents and interests. Here's a look at a few local food professionals and what inspires them when they're off the clock. When Katie Weinner talks about her relationship with Utah, she tends to use words like "lucky" and "blessed." 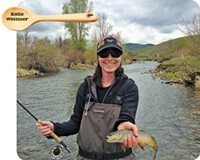 A snowboard fanatic and avid fly fisher, her culinary career began in Montana, where she'd moved to pursue her love of snowboarding. "I didn't want to go to college, but my mom said, 'I've been saving for college since the day you were born!'" Weinner says. So, she moved to Missoula and worked nights in restaurants to pursue her snowboard dreams by day. Weinner would eventually compete in disciplines like boardercross and big-mountain competitions, and even made a run at joining the U.S. Olympic Ski & Snowboard Team. A car breakdown left Weinner stranded in Squaw Valley, where she would find her way into the kitchen of an Italian restaurant, learning to make pasta and pastries, and eventually, to the well-known Plumpjack Cafe. The lure of even more challenging outdoor and culinary experiences led Weinner to Utah, where she has served as an instructor at the Art Institute of Salt Lake City, acted as the head development chef for the Mist Project, and created SLCPOP, a monthly pop-up restaurant and catering business. Her most recent venture is as one of 16 contestants in this season of Top Chef on Bravo. There were some 900 applicants, but producers sought Weinner out. "I just got an e-mail out of the blue saying, "Hey, we'd love for you to be on Top Chef!" she says. 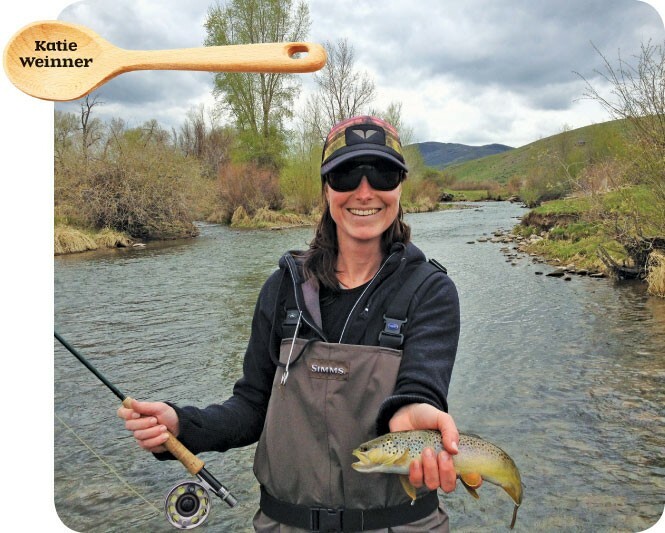 Known for her skills and creativity in the culinary subgenre of molecular gastronomy—a term Weinner doesn't relish—she sees parallels in fly-fishing, snowboarding and professional cooking. "Casting in fly-fishing requires finesse and precision—the ability to cast and place the fly in a precise spot—and so does cooking and plating a dish in a restaurant." Influenced by well-known chef Dan Barber, Weinner says she likes the challenge of making "faux food" —foods made from one thing that taste and look like something else: beet carpaccio that looks like meat, or faux cotton candy, for example. When she's not cooking, Weinner is likely to be shredding the steeps at Snowbird. "South Chute is my jam," she says, adding, "I'm just so lucky. Living here in Utah is sheer bliss. Sometimes I think, 'I just can't believe this is my life!'" When John Francis isn't making award-winning artisan jams and preserves, he's been known to fiddle around. Along with his wife, Casee, John is founder of Salt Lake City-based Amour Spreads (AmourSpreads.com), but he's also a nationally ranked fiddle player who has won Grand Champion awards for his playing, both as a teenager and as an adult. His love of music started in the third grade in Spokane, Wash., when he discovered the violin via a music program at his school. At age 15, he won his first National Grand Champion award at the National Oldtime Fiddlers Contest & Festival in Weiser, Idaho. "I got 15 bucks and a trophy for winning the junior's division," says Francis, who would go on to win that competition three years in a row. Just before his 18th birthday, John recorded his first album. At 27, competing against musicians from all over North America, Francis garnered his first Grand Champion honors as an adult and recorded his fourth album. Today, he competes in and judges fiddle contests, but now humbly calls himself a "decent amateur." Still, he placed 11th at this summer's Fiddlers Contest—not too shabby, considering that he plays fiddle only occasionally these days and was competing against full-time musicians. Amour Spreads was born during John and Casee's 2011 wedding anniversary, which they were celebrating at a cabin in northern Idaho. "We were hiking on a Forest Service road and stumbled upon thimbleberry bushes 6 feet high," he says. "There were berries everywhere, on both sides of the road." So, he and Casee picked some, got back to the cabin and said, "What do we do with these things?" After a bit of research on the Internet, they began making jam. That summer, they made "three or four hundred jars of jam," Francis says. "We were giving them to all our friends. I'd recently left my job of 20 years as an executive recruiter, and we were waiting for the universe to tell us what to do next." Well, making jam and jamming with world-class musicians aren't so different, according to Francis. There's the creative aspect of both musicianship and artisan food production. But Francis also says about both skills, "You get good at it by doing it over and over again." 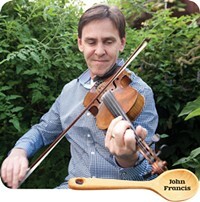 John's fiddle prowess can be seen on YouTube. Volunteering is important to Chef Romina Rasmussen—even more than butter is. Her popular French bakery Les Madeleines (216 E. 500 South) forever changed Salt Lake City's dining scene when it opened in 2003, as it was the first in the West to offer Kouing Aman, a pastry with melt-in-your-mouth layers of buttery, flaky decadence. Two years ago, she adopted a charming, handsome black cat. Rescued in a parking lot with a too-tight collar, Nibs quickly took over Rasmussen's apartment. It was after this that she decided to do more for the cat community. A lifelong cat person, Rasmussen jumped at the chance to work with Salt Lake County Animal Services' kitten nursery program, launched in 2013, where she bottle-feeds and tends to kittens, watching them grow from newborn buns of fur to fledgling cats. Running a successful bakery, Rasmussen doesn't have a lot of leisure time, but she really likes spending it with the cats. Twice a week, Rasmussen travels to South Salt Lake for her early-morning volunteer shifts. It's not easy, she warns. "Volunteering is a lot work," she says. "Tiny kittens need to eat every two hours." Rasmussen and other volunteers have helped hundreds of cats, working around the clock to keep the felines clean and nourished. Rasmussen recently fostered two raven-black, bright-eyed kittens, Manjari and Tainori (named after gourmet chocolate, naturally). She taught them manners, like how to use a litterbox and conduct themselves like proper housecats. Socializing young cats is important, and it's another way she gives her time to Salt Lake County Animal Services. She also supports the shelter by donating her baked goods and time at fun outreach events and taking pictures of cats to post on Facebook. "It feels good to do something for someone who can't repay you," she says. "It makes you feel like you've done something worthwhile. It's appreciated. You can see it in the animals' faces, and the staff. If animals aren't your thing, volunteer with another cause. There are never enough volunteers."